In my article on Vergere and Daoism, I discussed the concept of Li lines- the concept of following the natural path of one’s life, acting the role that one was born to play. From a Daoist perspective, free will exists, yet defiance of one’s Li line is seen as unnatural. Most pertinently to this discussion, the natural termination of a Li line occurs at death- indeed, the manner of one’s death may be an integral part of that Li line- as Ganner Rhysode so brilliantly demonstrated at the Well of the World Brain. If denying one’s Li line is unnatural, then it follows that defying the end of the line is similarly unnatural. The Jedi Path, which was written in the style of an in-universe Jedi text, explicitly describes death as the end of a Jedi’s life, when he or she is subsumed into the netherworld of the Force. In short, Jedi orthodoxy in the Rise of the Empire era viewed death as the end. Sith experiments to extend one’s life or cheat death were reviled by the Jedi- not just for the horrific means by which the Sith attempted these experiments, but also the selfishness it entailed. 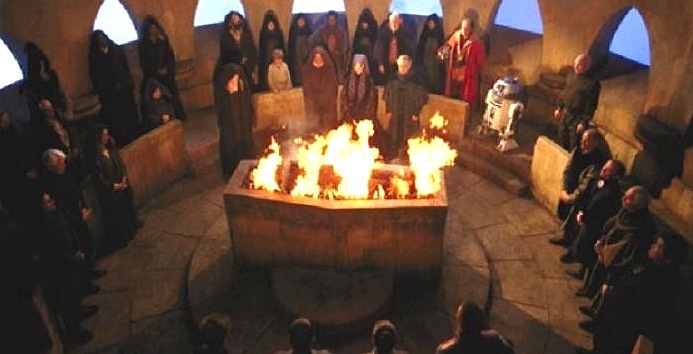 During this period prior to the Prequels, the Jedi Order by and large regarded tales of Whill Shamans being able to retain their identities after death as little more than fairy tales- at best “as metaphors for the Jedi Code’s final precept”. However, the Jedi do not draw solely upon Daoist philosophy and theology. In designing and elaborating upon the Jedi, George Lucas and the rest of the writers who have contributed to Star Wars have drawn upon various Eastern religious traditions, including Buddhism. Within Buddhism exists the concept of the bodhisattva. Essentially, a bodhisattva is an individual who has attained enlightenment- achieved nirvana- yet has chosen to remain on earth and help others to achieve enlightenment. In other words, an ambition to become a Buddha, or at least a Buddha-like figure. It is a state of utter compassion for all life, and the product of a desire to help to bring about a better world even when one has found an escape from the cycle of samsara- the eternal cycle of life, death, and rebirth. The various schools of Buddhism recognize differing notions of what being a bodhisattva entails. For example, certain elements of Mahayana Buddhism recognize three distinct paths: king-like bodhisattvas, who become a buddha then guide others to enlightenment; boatman-like bodhisattvas, who wish to become buddhas alongside the rest of humanity; and shepherd-like bodhisattvas, who wish to delay their own enlightenment until the rest of humanity has achieved it. Various Buddhist traditions recognize a variety of bodhisattvas throughout history, ranging from mythical figures and Buddhist kings to semi-historical scholars such as Shantideva. So, where am I going with this discussion of the luminous beings of Buddhism? In A New Hope, Obi-Wan Kenobi sacrifices himself to give the intrepid protagonists a chance to escape the Death Star. As Vader attempts to establish that he is now, in fact, the master, Obi-Wan’s body disappears, shocking the Sith Lord. 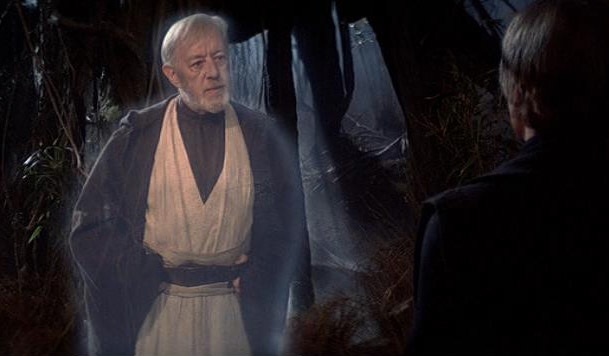 He then goes on to provide guidance to Luke (and briefly possess Leia during Splinter of the Mind’s Eye), appearing in the form of a Force Ghost. Just what becoming a Force Ghost entails wasn’t greatly elaborated upon until Matthew Stover penned his legendary novelization of Revenge of the Sith, and subsequent EU works elaborated upon it. Becoming a Force Ghost requires knowledge of a certain technique perfected by Whill shamans- a technique that can be passed on after death. It requires utter compassion for all life, and allows a Jedi to retain their identity after death, appearing as a luminous beingin the mortal world. Force Ghosts do not simply deny death for fun; they remain on the mortal plain in order to provide guidance to those who still dwell in the mortal coil. Or to explain how they told the truth “from a certain point of view”. In becoming a Force Ghost, a Jedi is making a choice to deny, for a time, his or her own eternal enlightenment, and the peace of death. He or she is choosing to temporarily forego a state of eternal rest and enlightenment in order to remain on the mortal plane and pass on knowledge to those who remain. In short, by becoming a Force Ghost, a Jedi is, on some level, choosing to act as a sort of bodhisattva. The Force Ghost does not easily fit into any of the three paths to bodhisattva-hood mentioned earlier, yet it does dovetail with elements of the first and last paths. To become a Force Ghost requires knowledge of the Whill techniques (which have never really been detailed)- in other words, a Force Ghost must have attained a certain quality of enlightenment. At the same time, a Force Ghost is delaying his or her entry into the netherworld for a time (or taking a vacation from it, in the case of Qui-Gon Jinn)- similar to the shepherd-like bodhisattva, who denies his own nascent buddhahood in order to enlighten the world first. The specific goals that Force Ghosts have had in mind have varied throughout the canon. Obi-Wan remained on the mortal plane for years to continue to instruct Luke Skywalker, the last hope of the Jedi. Whether it was to provide him with direct information (Zahn has Obi-Wan reveal a keycode to Luke in Allegiance), attempt to provide spiritual guidance to the young Jedi Knight, share military intelligence (warning Luke of the Ssi-Ruuk attack on Bakura), or justify misleading Luke about the true nature of Darth Vader, Obi-Wan was able to guide Luke up until the Thrawn crisis, seeing his pupil as the best hope for a galaxy ravaged by war and the Sith. Anakin Skywalker utilized the technique to seek his daughter’s forgiveness- forgiveness Leia would refuse him for decades. He arguably appeared to his descendant Cade to warn him of the perils of flirting with the dark side, although Cade’s altered state of mind at the time makes this appearance ambiguous. Luke Skywalker remained as a Force Ghost for an unknown duration (given that his death date has never been detailed), and spent much of that time providing advice to Cade Skywalker and urging him to clean up his life, regardless of how little Cade appreciated the help. Indeed, Cade was positively hounded by Skywalker ghosts- Luke, Anakin and Mara (depending on how drugged out Cade was), and Kol Skywalker all appeared to him at various points in his checkered career. Several other Jedi, such as Vergere, Arca Jeth, Qu Rahn, Yoda, and Halagad Ventor transcended their flesh upon death. The common thread between these ghosts is the desire to remain behind after one’s death in order to bring enlightenment, share wisdom, or make amends with those still among the living. Luke Skywalker exhibiting an incredible amount of patience with his wayward great-great grandson. I don’t think a Force Ghost can rightly be regarded as being on the mortal plane any longer. In fact, I don’t think they are denying death in any significant way. The truth of the matter is that they have died before death, and annihilated themselves in the Force. It stands out to me as a very concrete representation of the Sufi concept of fana fi-Allah wa baqa bi-Allah, annihilation in God and Subsistence with God. They have become absolute servants of the Force in this state, and the Force takes their form and personality when speaking through them to the people who need them. From where I look at it, the whole process isn’t unnatural. Look at how central immortality practices are to Taoism, in fact. That’s kind of the point of most schools of Taoist internal alchemy. Many of which dovetail with a lot of what goes on in Star Wars… including Sith spirits. The Force Ghost is kind of the ultimate culmination of what a Jedi strives for on a spiritual level. Certainly, it enables them to carry on their work post-mortem, but that also requires they become completely absorbed in the Force first and foremost, and shatter the illusion of separation.